Have you fallen in love with the Jaguar brand? 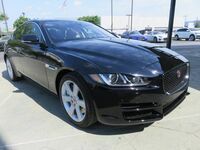 With a stable of luxurious, stylish and performance-tuned models to choose from, you cannot go wrong when you choose the English-based brand and Barrett Jaguar in San Antonio. 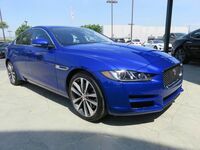 Learn more about Jaguar offerings in the compact and midsize luxury sedan classes with this in-depth 2018 Jaguar XE vs 2018 Jaguar XF comparison that highlights price, performance and capability. In the compact luxury sedan class, you will find few models more impressive than the 2018 Jaguar XE. Available in six trim levels – XE, Premium, Prestige, Portfolio, R-Sport and S – the Jaguar XE can be tailored to fit your specifications and adds an updated engine, the performance-tuned Jaguar XE S trim and innovative technology. The 2018 Jaguar XF is a stand out in the midsize luxury sedan class that is available in an XF Sportbrake wagon variant and six trim levels – XF, Premium, Prestige, R-Sport, Portfolio and S – that are available with a new Advanced Driver Assistance System. What Are the Differences Between the Jaguar XE and the Jaguar XF? Affordable luxury is a highlight of the Jaguar brand and is a key aspect of this 2018 Jaguar XE vs 2018 Jaguar XF comparison. 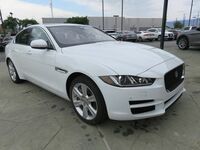 With a starting price that stands at just $35,735, the Jaguar XE is a tremendous value with an impressive array of standard features that includes 17-inch wheels, a power sunroof, Luxtec interior, an eight-inch Jaguar InControl Touch touchscreen display, Bluetooth and more. 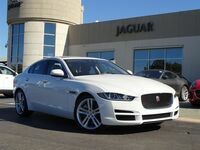 If you are looking for an upgrade, the Jaguar XF starts at $47,775 and features Jaguar Drive Mode technology, a 380-watt Meridian sound system, an eight-inch Jaguar InControl Touch infotainment system and more. With lightweight aluminum framework and potent powertrains, power and performance are highlights of the Jaguar brand that translates to Jaguar XE and Jaguar XF sedans. Entry-level Jaguar models can be equipped with a 247-horsepower 2.0-liter Ingenium turbocharged four-cylinder engine that is married to an eight-speed automatic transmission to make 25 mpg in the city and 34 mpg on the highway or a 180-horsepower 2.0-liter turbodiesel that makes 42 mpg on the highway. Available All-Wheel Drive with Intelligent Driveline Dynamics will provide an instant upgrade in performance. Drivers who want to amp up performance will find that 2018 Jaguar XE and 2018 Jaguar XF models check all the boxes. A refined 2.0-liter Ingenium turbocharged four-cylinder that manufactures 296 horsepower and is capable of sprinting from zero to 60 mph in just 5.4 seconds upgrades performance. Still not enough power? Upgrade to Jaguar XE S and Jaguar XF S trim levels that play host to a 380-horsepower 3.0-liter supercharged V-6 power core that possesses a top speed of 121 mph and is capable of a sub-five-second zero-to-60 mph time.